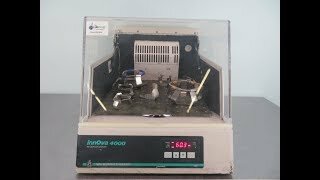 The New Brunswick Innova 4000 Benchtop Incubator Shaker brings you tight temperature control, and consistent agitation in a large capacity easy to use format. The large 18 x 18 platform for this incubator shaker can be adapted to fit your containers, up to eighteen 250ml flasks, or five 2 liter flasks. The platform of this lab shaker has an orbit of .75 inches, and an agitation speed of between 25-500 rpm. The New Brunswick Innova 4000 Incubator Shaker is built to protect users, with an automatic cut out when the lid is opened, a failsafe thermostat, and a hydraulic arm to ease opening and closing. This smart Incubator Shaker is microprocessor controlled and monitored, with a self-correcting feedback control that compensates for changes in temperature. This incubator shaker has a temperature range of up to 60°C that can be controlled from the upfront, digital, touch pad control panel. This New Brunswick Innova 4000 Incubator Shaker has been thoroughly inspected and is performing to expectations. All of our lab equipment comes backed with our standard warranty. Should you have any questions, please don't hesitate to contact us.